That giant pile of corpses ahead of you is twitching. You know that's bad news, right? In Metro Exodus pretty much everything that happens is bad news, but a twitching pile of corpses is news of the notably negative type. And, yes, there's a giant mutant mole hungry to eat your face. Shoot it! SHOOT IT!!! Such is a minute in the life of Metro Exodus hero Artyom, surviving in an irradiated Russia 25 years after the world's nations got a bit too trigger-happy with their nukes. Shooting, exploring, and surviving in the face of the ever-growing horror of this harrowingly beautiful world. One bit of good news for Artyom this time out, though, is he's out of the tunnels! 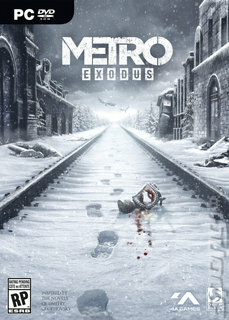 This opens up the world of Metro from the claustrophobic underground warrens of previous games to terrifying wetlands, deserts and ruins. There are sprawling stages for you to explore now, with chances to tackle their various slavers, bandits and giant shrimp monsters in whatever way you see fit. It's a world that oozes atmosphere and the stench of death in equal measures. Make sure you keep your wits about you and your gun loaded, or you'll most certainly find yourself in the belly of something with no right to exist.